Steam created by electrodes allows application with a wide range of water hardness without added filtration. 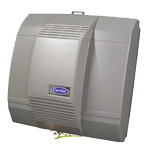 Effective, tube dispersion technology prevents condensation in the duct. Designed to tolerate a wide range of water conditions. Can be mounted on indoor unit, duct or wall. Easy to replace steam canister.